Refreshes the breath and invigorates the gums ensuring effective, natural oral care. Packing : 1 toothpaste tube. Divine Love® Ancient Formula Ayurvedic toothpaste is always the favorite of everyone including royalty, film stars, beauty queens and spiritual masters. Divine Love® Ancient Formula Ayurvedic toothpaste, consisting of more than a dozen herbs is sugar-free and purely vegetarian. It gently cleans the teeth, refreshes the breath and invigorates the gums ensuring effective, natural oral care. Directions: This gentle toothpaste should be used whenever you need freshness in the mouth and the best dental hygiene. 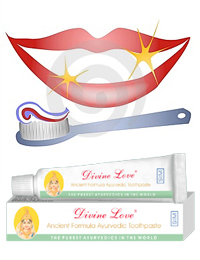 Brush your teeth every 6-8 hours or after every meal with Divine Love® Ancient Formula Ayurvedic Toothpaste. THE CONTENTS OF THIS SITE ARE COPYRIGHT © 2001-2018, SELECTED INTERNATIONAL MARKETING PTY LTD, AUSTRALIA.